(Bloomberg) -- The biggest trading volume in copper call options on record signals supply troubles brewing in the market. A spread trade worth $6.5 million was posted just after 7 a.m. on Comex in New York in a bet that the price of the metal used in wires and pipes will surge past $3.05 in a few months, from Monday’s settlement price of $2.909. 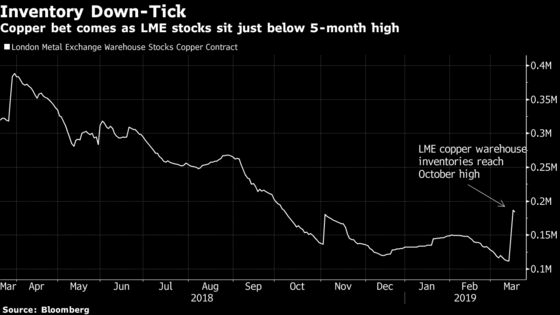 Copper production will trail consumption by 116,000 metric tons this year, a second straight deficit, Citigroup Inc. analysts said in a report in December. While orders to withdraw the metal from warehouses tracked by the London Metal Exchange fell by the most on record on Monday, inventories are still down 43 percent in the past year. The restart of Codelco’s two smelters have been delayed to April, adding to supply woes. A total of 5,250 lots of call options giving the holder the right to buy the metal for delivery in July at $3.05 a pound and the obligation to sell at $3.35 changed hands at 4.95 cents. The block trade appears to be hedged with 1,195 lots of May futures at $2.92 a pound, allowing the holder to profit from bigger swings in the metal, even if prices don’t rise all the way past $3.05. By the time the market closed in New York, more than 11,000 call options have traded.